Copper, Mirena and Jaydess are all suitable choices for users who cannot use estrogen containing methods including breastfeeding mothers. Leave plenty of time to get to your appointment and make sure you have eaten something in the hour or two beforehand. Arrive 10mins before your appointment time, this will allow for paperwork, a pee test and to use the washroom. Usually pain medication is not needed before or after the IUD is inserted. If you feel cramping after your insertion you may take acetaminophen (Tylenol) and/or ibuprofen (Advil/Motrin) to help with pain. Sometimes holding a hot water bottle on your lower abdomen also helps. The IUD is inserted during a simple clinic procedure (the actual procedure is only a few minutes). The doctor will examine you to see which way the uterus is positioned and then insert a speculum (like the one used for a PAP). Next, some freezing is placed in the cervix (this is optional but recommended for pain control), the cervix is then held in position and the uterus is measured for length, and the IUD is then placed inside the uterus. Most women feel cramping during the process of measuring, as well as when the IUD is placed. It is normal for the cramping to last a few minutes, and some will experience cramps for the rest of the day, and perhaps into the next morning. Occasionally some women feel queasy or lightheaded after the procedure. If possible, bring someone to drive you home after. Uterine perforation: rate of 1 per 1000 insertions (rare). All perforations occur or are initiated at the time of IUD insertion. 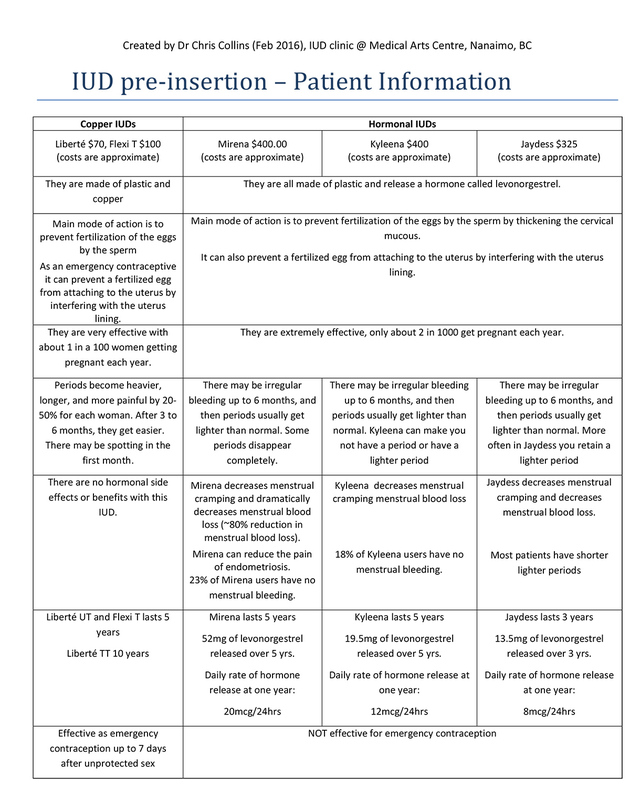 Infection: a rate of 1 in 1000 risk for pelvic infection exists in the 20 days following the insertion but the risk is the same as a non-IUD user thereafter. Expulsion: Approx. 5% or 5 in 100 risk of IUD expulsion (falling out) leading to risk of pregnancy, usually in 1st year. A user who has previously expelled an IUD has a 30% chance of expelling a subsequent IUD. Failure: If a woman becomes pregnant with an IUD in place, the presence of an ectopic (also known as tubal) pregnancy must be excluded. If the woman chooses to continue the pregnancy, the risk of miscarriage is increased as long as the IUD remains in place.